This month and next it’s all about holiday parties and gathering with friends for spectacular shows and events. We’re already sharing some of the unique cultural holiday festivites scheduled in our community including Yalda, Hannukah, Christmas, Kwanzaa and New Year’s Eve/Day. You also want to look amazing during the evening club scenes and we’ve got several outfits that’ll work for you as raqs lifestyle wear. Throw a Coat Over It! If you’re like us, we’ll throw a coat over anything and take it off to reveal something fun and cute…putting some thought into our garments. Most places will be warming the atmosphere so have no fear wearing a skirt or shorter sleeved top to an event. You’ll be happy you did when you start dancing. Our suggestions for this week include clubbing it up in this cute wrap top and skirt. It’s oh so cute. This ensemble comes in this gorgeous black and white winter print. You can also mix and match to fit your preference. Add a statement necklace or rhinestone jewelry to the set for added bling. This also makes a cool gift for the party goer in your life. Retails at a low price and can be custom made if you give us a call. Let us know what holiday parties you’re attending this year and where you’re dancing. We’d love to feature it. Looking forward to hearing from you! Next weekend MissBellydance.com’s sisters at AFBD will house Georgia Raqs’ Marhaba Atlanta Festival directed by Maiea and Kalinka Bellydance Productions. This event will feature the outstanding talent of Brazillian Superstar Lulu Sabongi and Chudney Raks. This is an outstanding chance to study with these amazing raissat. With Lulu Sabongi, attendees will learn Travelling Steps, Technique and Combos for the Advanced Dancer plus a choreography. With Chudney Raks, you get “Confident Combos” plus an extra course called Geometry, Turns and Level Changes on Sunday from 2pm-4pm. The event begins on Saturday morning at 10am. It’s can’t miss opportunity as many of these legends are very busy and no one can predict when they’ll be able to return to the Atlanta area. So don’t miss your chance. Click here to register. 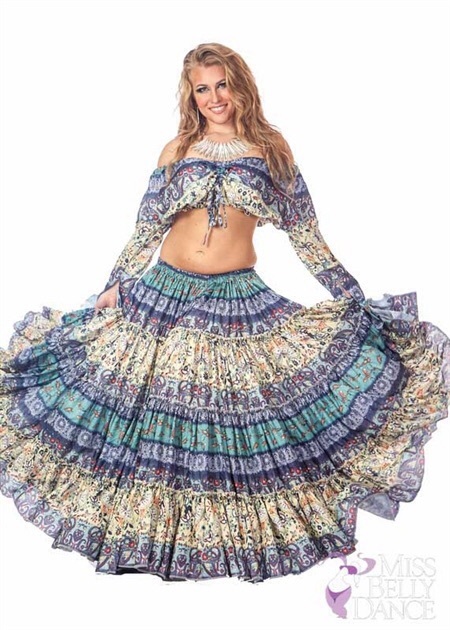 All attendees will receive a 10% discount from MissBellydance.com to use toward your purchase of any of our online items. You’ll receive the code from the hosts on the day of the event. Looking forward to seeing everyone there! Happy Harvest everyone! It’s that time of year when we gather together to be with friends, do fun things, dance and enjoy the spirit of friendship. That also means holiday shows…and lots of them. This year we have a variety of bright colourful spinning skirts and tops to match the mood of the season. Our new prints are bold and colourful. We’ve gone beyond the traditional deep reds to more vibrant hues, golden tones, slate greys and even yellow. Each skirt has a matching top with either elastic on the bodice edges so that it stretches to fit comfortably or adjustable ties. The waistline in the skirt is also elastic. Be sure to grab these quickly before they’re all gone. Makes great troupe wear and knowing how creative our friends and fans are, you’ll find a way to make it something you could wear everyday. We want to see that. Place your orders by clicking here and here. We’ll get these out to you as fast as we can.